After a terrible swim on Saturday that left me wheezing like a 75-year-old man with emphysema (before even swimming 100m), I spent the rest of the weekend feeling beaten, deflated and wondering whether this 70.3 dream is just one of my crazy schemes. It also involved eating leftover rainbow cake from Da Chicks birthday party and doing the ugly cry in quiet moments locked away in the bathroom. 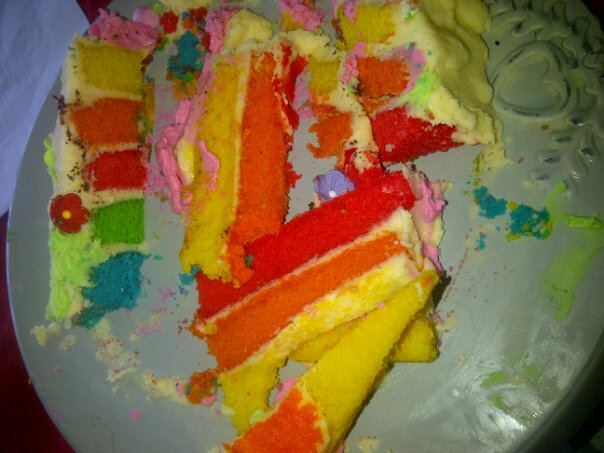 After the kids went home, Da Mom attacked the leftover rainbow cake like a savage beast. oooh my word, just watched that clip and now I’m crying like a 6 year old who’s just discovered that her favourite Barbie doll was eaten by the dog…..
Leonie, we can do this!!! we may not be the best swimmers, but it seems like we’re BIG dreamers….we WILL previal!! see you on the track tomorrow.